Lee Atkinson is bowled over by the beautiful beaches of Esperance My first visit to Esperance was a quick one, a desperate detour on a trans-continental road trip across the Nullarbor when we couldn’t face yet another deep-fried roadhouse disaster masquerading as food or muddy cup of instant coffee. A 400km return trip for a decent feed seemed a small price to pay. The lunch was great (I remember it still: home-made gnocchi in a rich tomato sauce for me, towering chicken focaccia for my friend, greedily devoured whilst overlooking the sea at Taylor Street Jetty Tea Rooms) but we really didn’t have time to see much of the town. Shortly after that flying visit, Australian Traveller voted Esperance the second-most beautiful town in Australia (April/May 2009 issue), and I started to wonder what I had missed. Then I discovered that Lucky Bay, a beach in nearby Cape Le Grand National Park, had been scientifically proven to be the whitest beach in Australia (although similar claims are also made by Whitehaven Beach in the Whitsundays and Hyams Beach on the New South Wales south coast) and my fate was sealed – I had to go back. This time, we approached Esperance from the west, three-quarters of the way through a meandering road trip along the southern coast of Western Australia, camping out in national parks in a campervan. The entire trip had been one impossibly beautiful beach after another, and we’d lost count of how many we’d camped beside, walked across and overlooked from clifftop lookouts. Call us smug, but as far as beaches went, we’d thought we’d seen it all. Until we got to Esperance. The beaches are gob-smackingly glorious. Dazzling white sand lapped by turquoise water, so implausibly picture perfect they look photoshopped. We couldn’t tear our eyes away from them, and pulled over again and again to take photographs as we wound around the aptly named Great Ocean Drive on the outskirts of town that traces the sweeping curves of the coastline with views every bit as impressive as that other great ocean drive in Victoria, without the crumbling rock stacks of course – or the traffic. There’s no denying the stunning beaches are the main drawcard in Esperance. But there’s plenty of other things to do. We head back to the jetty tearooms for another great lunch with a view, take a walk along the historic Tanker Jetty to see if we can spot the resident sea lion, Sammy (we do), browse through the gift shops and galleries in the historic buildings in the Museum Village trying hard not to buy up too big at the fudge shop, check out the art on show at the Cannery Arts Centre and resist the urge to bend the credit card at several other art galleries around town. But it’s the beaches that have us mesmerised, so we head out to Cape Le Grand National Park to see whether Lucky Bay really is the whitest beach in Australia. There’s a campground overlooking the beach, but it’s really just one big open area, so we head instead to Le Grand Beach where individual sites are tucked behind the dune and well spaced from each other, and then spend the rest of the day walking along the clifftops, watching sea eagles soar above carpets of brightly coloured banksias and other wildflowers in full bloom. Later that night we spend quite some time debating the degree of whiteness of Lucky Beach. The devil’s in the details, we decide, and we’d need to see the sand side by side with the other claimants in Queensland and southern New South Wales (we stash some in a jar for future tests) but we both agree that we feel pretty lucky to be here. Esperance is 715km south-east of Perth, around a nine-hour drive. Cape Le Grand National Park is 50km south-east of Esperance by sealed road. Skywest has daily flights to Esperance from Perth. skywest.com.au. 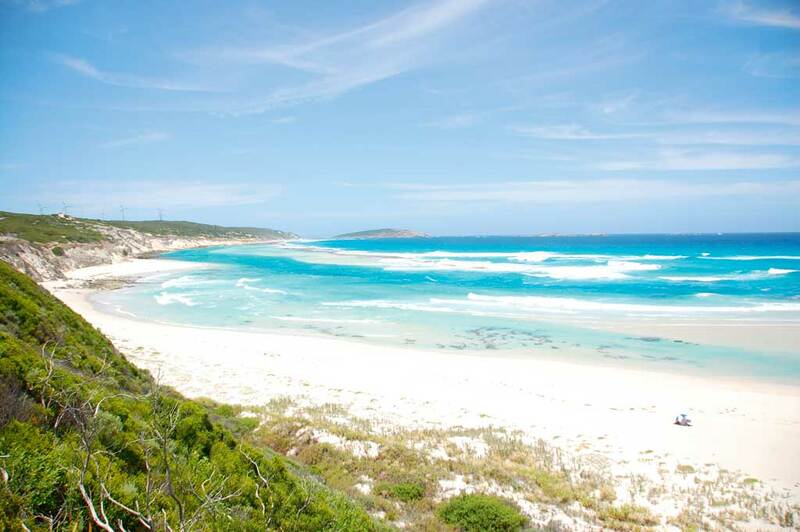 Great Ocean Drive: 38km coastline loop drive on the outskirts of Esperance with drop dead gorgeous views. Thistle Cove Walk: 90-minute return bushwalk along the clifftops of Cape Le Grand National Park. Historic Museum Village: collection of historical buildings relocated from various locations in and around Esperance, now housing art, craft and design shops. Don’t miss the Esperance Museum which includes bits of the American Space Station Skylab which famously crashed to Earth in 1979, spreading debris around Esperance and across the Nullarbor. Located off Dempster St, open daily 1.30pm-4.30pm. Kepa Kurl: learn about bush food and the local indigenous culture on a 4WD tour. They also have an Aboriginal art gallery in Museum Village. 08 9072 1688. kepakurl.com.au. Don’t let the name fool you, the Taylor Street Jetty Tea Rooms offer much more than just tea and scones (think fresh seafood and great pasta) in this former old hospital that was relocated from Fremantle in the 1930s. Taylor St jetty. 08 9071 4317. The Esperance Visitor Centre is located on the corner of Dempster and Kemp Sts in the Historic Museum Village. 1300 664 455. visitesperance.com.